Inside: Discover five practical ways to make a house feel like a home. Like, using a rug, a piece of art, or a throw pillow as inspiration for room colors. This is a sponsored post written by me on behalf of CORT. All opinions are 100% mine. This post contains affiliate links. In the past, I dreamt of having my own space to decorate. When my husband and I bought our first home, I was so excited to begin decorating to make our house feel like a home. I made some mistakes along the way, like painting my kitchen a pomegranate red or buying furniture that didn’t fit well in our space. 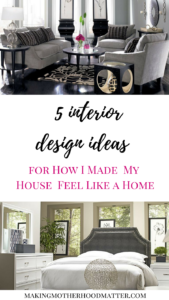 However, along the way, I have also learned five simple interior design ideas for how to make a house feel like a home. One element you will find in homes with great design ideas is mixing textures. For example, a masculine leather couch, fluffy tweed pillows, a smooth glass vase, and a rigid wood table, like that found in CORT Furniture Rental, creates a warm and inviting space. Overall, whatever textures you choose, place a variety in your room to give it a homey feeling. Choose a color palette to stick to for each room. Personally, I like to use a rug, a piece of art, or a throw pillow as inspiration for room colors. Another step for bringing your design ideas to life is to make a statement with a piece of artwork. It can be big or small. Adding art to a room will personalize your space and make it feel more like home. In addition, another design element you will find in popular interior design ideas is to use both symmetry and asymmetry in a room. You may put two of the same candle holders on the wall framing in a mirror, or use two of the same sitting chairs on either side of a table to add symmetry. In the same way, not everything needs to be symmetric. You can use asymmetry to draw the eye across a room. Overall, you will want to stick to your color palette for your design ideas, especially for your furniture and art pieces. One great option for convenient, furniture on-demand is to rent furniture from CORT, a furniture rental provider that has move-in ready packages. Once you have your room set up using your color palette for the main items, adding a small pop of color will make a big design impact. What design ideas do you use to make your house feel like a home? P.S. 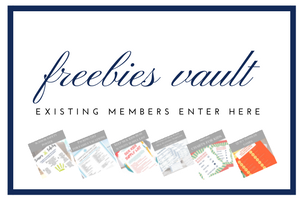 If you enjoyed this piece, you may also like How to Keep the House Cleaned and Organized +Printable, including 2 free planning templates for keeping your house clean even with kids running around. Hi Charlotte! Thanks for stopping by! Yes, my challenge over the years has been to simplify, colors, patterns, nick-knacks, you name it. So I can relate. I sometimes feel like with 3 kids we have too many pops of colour! Lol! Yes, I know what you mean.